The 70’s are making a major comeback! One of my favorite trends this season are flared jeans. I love them because they’re super versatile. Pair them with a chunky heel and a blousy top for a perfect retro look! Below are more of my favorite flared jeans for Fall from Nordstrom. these flares look like the perfect fit. they flare is just right. gorgeous look. I love the 70s trend. You look gorgeous. The flared jeans are awesome. Those flared jeans are amazing!! They fit you so well! These jeans looks fabulous on you! Love the J.Crew hat! Have a nice day! I love the look of flared jeans…I really need to snag a pair this season! I love blue on blue and the flared jeans trend is more than welcome by be! I loveee this top and these flares make your legs look a million miles long! Love the sleeves on your top! Such a great casual look! Love the tucked-in shirt! And that hat is so darn cute! Love the flare jeans!! You styled them perfectly! Fantastic denim on denim outfit! Also, love your sunnies girl! Love that flared jeans have made a come back! 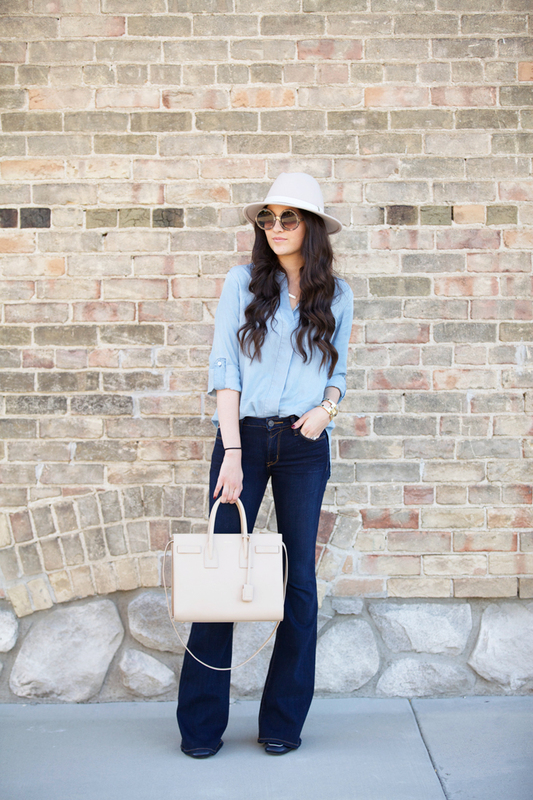 I’m loving the way you’ve styled your flares here, giving it a nice modern twist with the chambray. Thanks for the inspiration and I hope you have an amazing day, beauty! Nice outfit! Love the flared jeans with the chambray shirt. Stunning look. Denim on denim looks always great. 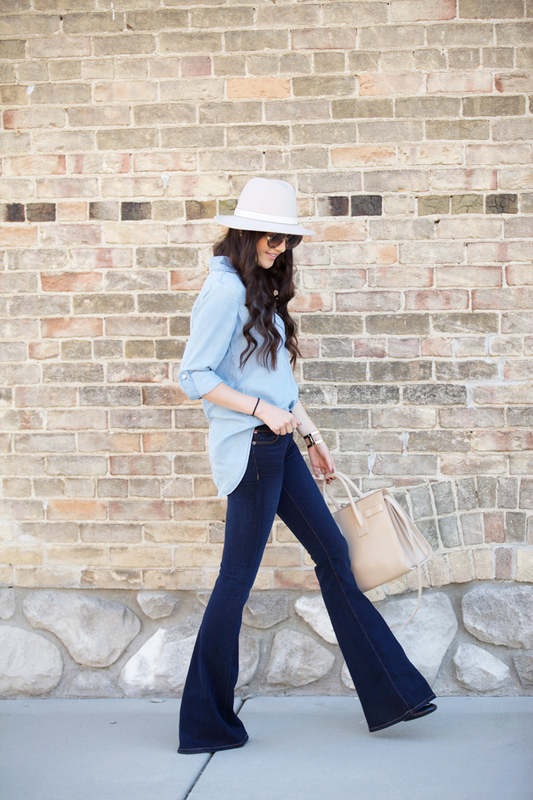 I seriously love flares more than anything…more than skinnies definitely! Glad to see them comeback! Nice look! I’d love to see the shoes better. They’re also so flattering! I love the dark wash. Flair jeans are a huge trend this fall, I’m loving how they make your leg’s look so skinny! I just ordered a pair! Those jeans are the perfect pair of flare jeans! Such a perfect fit and so flattering! Also love it paired with a hat. Oh my gosh!! I adore this! Those flare jeans are perfect on you! This outfit is so seasonal, I love it! Love how you styled these! I recently bought a pair of flared jeans, but haven’t figured out how to wear them yet. I love the denim on denim and those round sunglasses make this look oh so 70s! Great look Rachel! Love the denim on denim. The flared denim makes you look so tall! LOVE LOVE LOVE these jeans! I bought almost the exact same ones in black about 6 years ago and could never find a way to make them work but always held on to them knowing they would come back one day and it’s now! Love these flared jeans, they look amazing on you! So chic! I’m so glad flares have come back! Love the sunnies, too! Loving the flared look on you! I need to get a pair of flare jeans in my life asap! Love the chambray with your flared denim. Very cute look! Obsessed with those flares Rachel!! I have a new lifestyle blog that I know you would love, focusing on fashion, motherhood and travel! http://www.touchofcurl.com please check it out! I so love the flared jeans you have there. Such a classic look! Love it! Looks great! I love this style on you. It almost looks a bit retro. Love me a good pair of flares! I love this pair! So so flattering! Your hair looks beautiful in these photos! These jeans are gorgeous! I love this look! 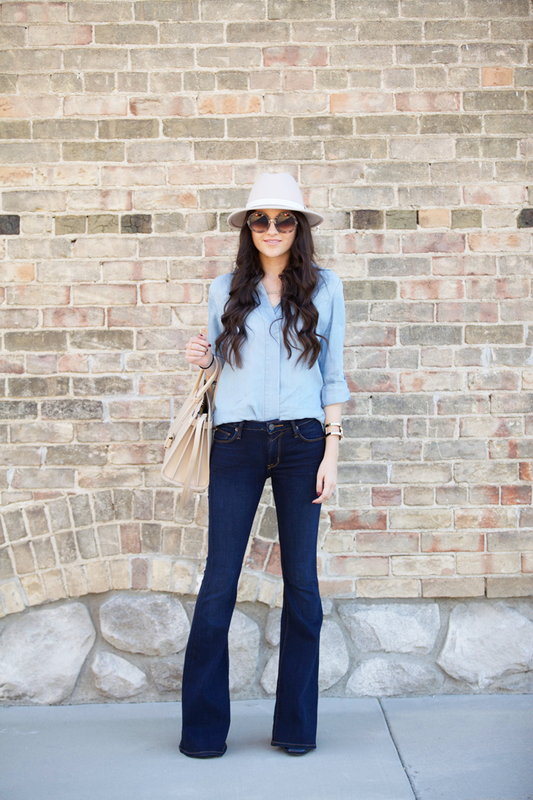 Love the flare jeans and also the hat! It has looked so cute in every insta! That hat is so cute! I love the flared jeans too! Love this look..this hat is amazing!!! 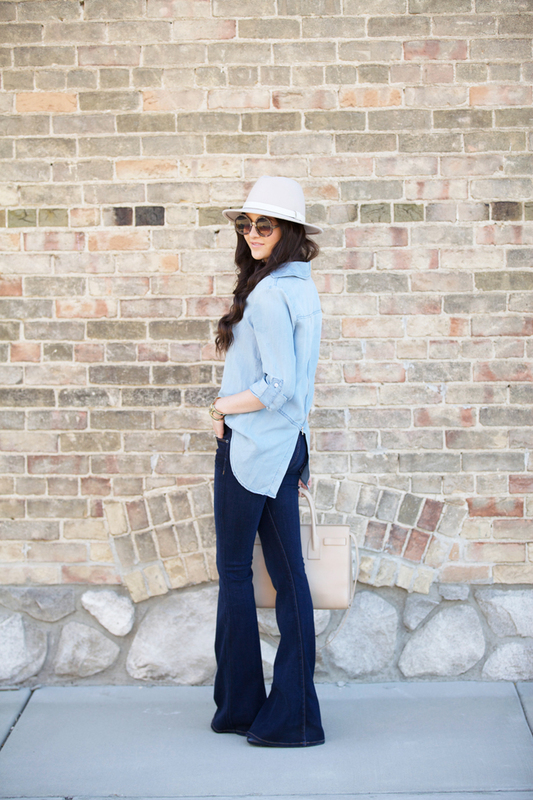 You can’t go wrong with flares! Flares are my favorites right now and you look amazing in yours! They got the perfect wash! Loving those jeans on you! And the detail in the back of the top is really cool. Such a cute throwback look! CUTE! These flair jeans look perfect on you! Love the bell bottom jeans! I LOVE those flare jeans…perfect outfit combo! Love the dark + light wash denim together! Flares have to be just the right length to work perfectly. These flares look good on you, however – they either need to be worn with a higher heel, or they need to be hemmed. Dragging jeans on the ground obviously is going to wreck them. 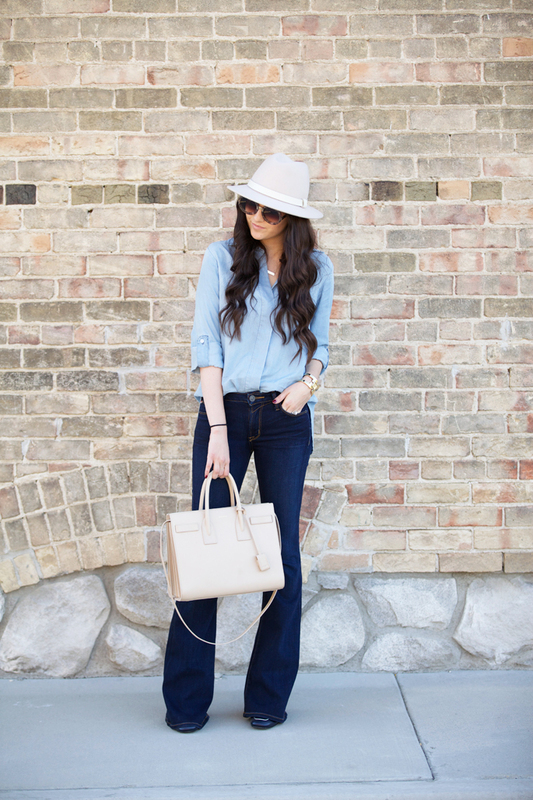 Love the accessories – especially the hat and the handbag! I am going to rock wide leg pants, flared jeans and skinny black jeans all winter. That’s it! Great pics and thanks for the other choices. I am so loving flares right now! They look great on you! I am loving flared jeans right now!